I am very fortunate to have adventurous parents, so instead of spending my holiday at home we made a trip out to Yellowstone National Park to enjoy a snowy white Christmas. And a white Christmas it was! During much of our stay the skies were dreary and grey, and we got plenty of snow, which limited the photographic opportunities somewhat since the park really comes alive under clear and sunny skies. The park averages 150 inches of snow each year, which makes it impossible to reliably keep all the roads clear. So, instead of constantly running the snow plows, the Park Service closes the park to ordinary wheeled vehicles and you have to get rides in tracked “over-snow vehicles” from guides. There are a number of different kinds of machines operated in the park, but by far and away the most interesting is the ‘Bombardier’. They were designed by Canadian Joseph Armand Bombardier in the 1940’s, and nothing has changed about them since. They are incredibly loud (they offer you ear plugs when you get in), snow comes in through all the cracks, and they require skilled drivers to keep them on the snowy roads. The park’s concessionaire Xanterra operates a fleet of about two dozen of these machines dating back to the 1970’s, and that’s the transportation you take when you go on the 2-3 hour ride from Flagg Ranch to the Snow Lodge at Old Faithful Geyser Basin in the heart of Yellowstone. As a result of the limited transportation and lodging facilities, the park transforms from a bustling tourist destination that attracts over 2 million visitors during the summer months, to a quiet and magical winter wonderland. Well, except for the occasional roar of those Bombardiers and the buzzing swarms of snowmobiles. Fortunately the park is working on that, and already the noise has subsided considerably due to the requirement that snowmobiles must use 4-stroke engines instead of the much noisier 2-strokes, and can only be operated in the presence of a tour guide (which limits the quantity of machines roaring down the roads). 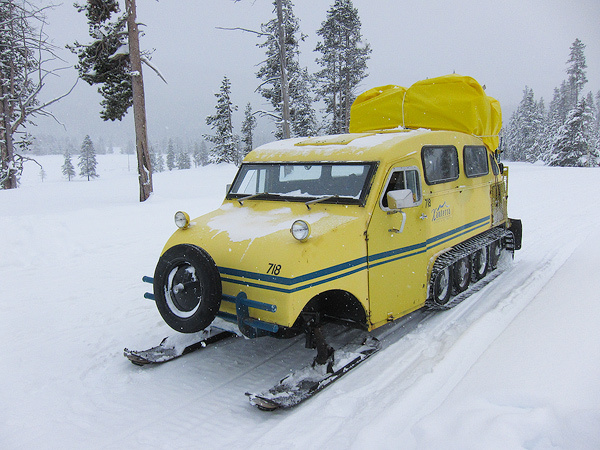 A Bombardier - the snow buses used for transport to and from the Old Faithful basin's snow lodge. Yellowstone was the first national park in the world, established by President Ulysses S. Grant in 1872, so you naturally expect it to be a truly special place. And it does not disappoint, as long as you can get past the necessary infrastructure to support its popularity. Yellowstone is most famous for its geothermal features, of which it has at least 10,000, accounting for half of the geothermal features in the entire world! The park is home to such a remarkable collection of volcanic activity because it sits above a giant stationary mantle hotspot, which formed the Yellowstone Caldera: the largest volcanic system in North America. While there haven’t been any active lava flows in the park since 70,000 years ago, most of the 300 geysers in the park erupt several times a day. Of course, getting the timing right so you are there when one of them goes off can be tricky, as many of the geysers don’t adhere to a strict schedule. My parents and I happened to come across the Penta Geyser (a relatively small geyser) as it was erupting, and the steam, wind direction, and sun were all in the perfect position to make for a very memorable moment. I decided to capture this scene with my dad skiing along the boardwalk to add to the story. Notes: I could have dropped to iso 200, or even 100, and still had enough shutter speed to freeze the water.. but in the heat of the moment these are the settings that came out. I needed to do a fair bit of processing in order to control the flare, and I added a tiny bit of canvas at the top to give the geyser blast some more space. I took 92 exposures during the eruption to get this one, which was the very last one I took! For a geyser to form, three ingredients are necessary: water, heat, and plumbing. Water from rain and snow filters down into the Earth through the fractured volcanic rock and collects in an underground plumbing system. Here it is heated by the Earth’s magma, and pushed back upward through a constricted plumbing system. Pressure builds, allowing the water to become super heated (meaning it remains in the liquid phase, despite being well beyond the boiling temperature at atmospheric pressure). Eventually the super heated water reaches close enough to the surface so that the pressure drops and the water flashes into steam, releasing an explosion of water and steam that can reach over 200 feet (the tallest geyser is Steamboat Geyser, which can reach 300 feet in the air). When my parents and I were visiting the park we were very fortunate to see one of the most impressive geysers go off up close and personal: the Beehive Geyser. This one typically erupts twice a day, but is very difficult to predict. A small indicator geyser (effectively a pressure relief valve in the plumbing) goes off about 20 minutes before the primary geyser, which then spews water and steam up to 250 feet into the air for 4 minutes. The blast is so sudden and powerful that the ground shakes and it sounds like a jet engine! If you’re ever in the area try not to miss this one – it’s a thrilling experience. Geysers are only one of the four geothermal features in the park, the others being fumaroles (steam vents), mud pots (bubbling mud), and hot springs. Hot springs are essentially the same as geysers, but have unconstricted plumbing so there are no violent explosions. The temperatures of the pools in Yellowstone can get very hot – right up to the boiling point which is about 93 degrees Celsius at that elevation. Thermophilic bacteria thrive in this environment, and form a myriad of colors depending on the type of bacteria. Of all the springs I visited during my stay, I found the most photogenic to be the Blue Funnel Spring, in the West Thumb Geyser Basin. This beautiful round spring is heated to between 172 and 182 degrees Fahrenheit, but the temperature outside of the spring drops off quickly, allowing the winter snows to create a beautiful blanket of white around it. Yellowstone is not only famous for its geothermal features, but also for the incredible abundance of wildlife that lives there. 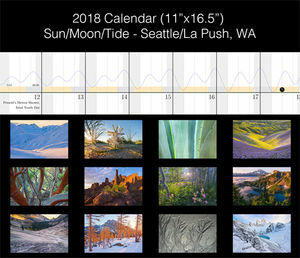 The park sits at the center of the largest remaining nearly intact ecosystem in the Earth’s northern temperate zone: the Greater Yellowstone Ecosystem. Many visitors come to the park in search of bison (which are harder to avoid than to find), black bears, grizzly bears, elk, wolves, etc. The best place to see wildlife is in the Lamar Valley, which lies in the northern part of the park. My parents and I also made the trip up to this area for a few days in hopes of seeing some snowy creatures, but that will be the subject of my next post. On the way up we got stuck in the first of many “bison jams” of our trip. Much of the wildlife in the park makes use of the road systems during the winter as it’s a lot easier to walk on the packed down snow, so inevitably you end up sharing the road with them. 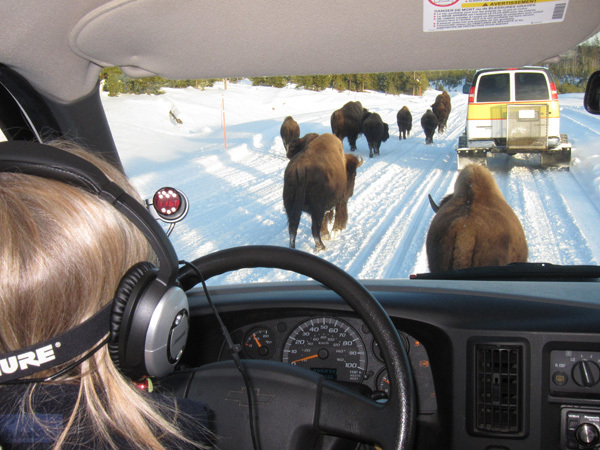 Being almost as big as a small car, the bison don’t really like to give way, and some “jams” can last over half an hour! Fortunately they rarely get so aggravated that they try to chase you off the road. But it does happen. And it did happen to me, two years ago, and you can see the damage in that post from 2008: bison attack! I’ll continue on with the wildlife we saw on my next post. I hope you all have a wonderful new year! What an awesome place to spend Christmas! I love the one of your dad and the geysers. Even though I have been to Yellowstone, I find your description of the geothermal and wildlife activity captivating. You are lucky to have such parents. I was first in Yellowstone when I was 17 in the summer right after my high school graduation with my parents. I have fond memories of trying to time geysers, making photographs of pools and hot springs, and watching my dad do the same. Your image of the skier (your dad) and the geyser erupting is magnificent, as are the subtle pastels of the pool in “Winter’s Warmth.” I would think it would be quite a treat to be there in the snow if you can get some clear days to photograph.